Manatee Springs State Park sounded like an amazing place to visit. 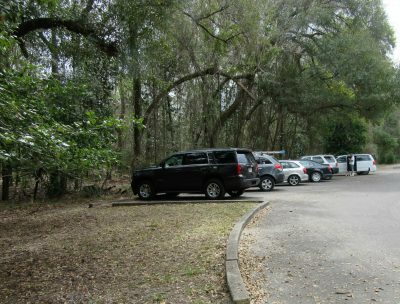 The three of us loaded up in the car and plotted our course for this well-known Florida State Park. 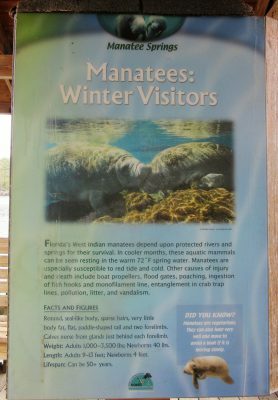 Hoping, really hoping, to see at least one manatee, we paid our $6 admission, but the gentleman taking our money and giving us information said that the warmer weather had caused the manatees to move out of the springs. He went on to say that those that have been seen have been at the mouth where the spring feeds into the Suwannee River. 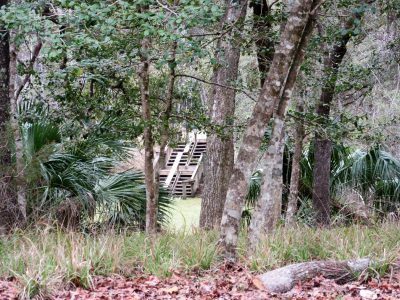 We drove through the lovely park filled with that interesting combination of palm trees and live oaks, the live oaks decorated beautifully with hanging Spanish moss. It only took moments to find the campground, which we of course explored for future reference. Jim writes about it here. He and I decided that we could enjoy a future winter sojourn in this park. 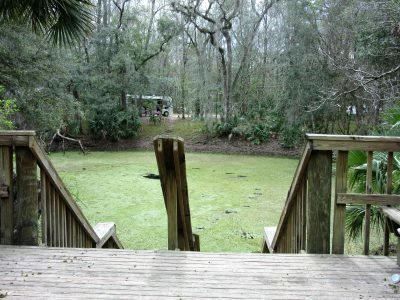 From the campground, we could see some green water with stairs descending. As we made our way deeper into the park, we found the hub of activities, the parking area, and the water we had viewed from afar. Exiting the vehicle, we wandered over to the stairs, meeting a diver who had just come up the stairs after a dip in the green water. I assume this is a karst covered in duckweed like Olsen Sink. A place to dive – a karst in the park? The opportunities for water fun and exploration abound here. 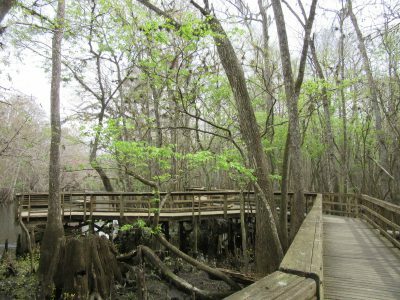 This spring pumps out about 100 million gallons of clear, fresh water daily, so the water of the spring run is gorgeous. Visitors may choose to swim, snorkel, scuba dive, kayak, etc. 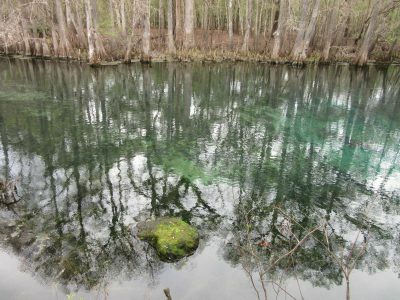 It is only when it is cold enough that the manatees swim up the Suwannee River and into the warmer water of the spring pool. 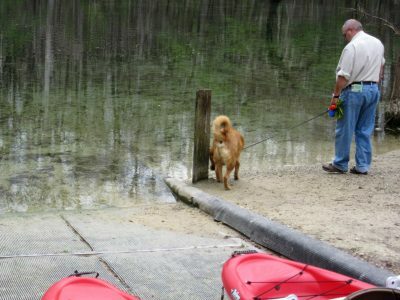 Chewie could walk almost anywhere, including into the spring run at the canoe/kayak launching area, except on the boardwalks. Due to people who are afraid of dogs or dogs who may not like each other potentially meeting in such an enclosed space, dogs are not allowed there. Jim entertained Chewie while I walked the length of the boardwalk through the hardwood marsh to the river. Afterward, Jim and I switched places. We did not see any manatees. In fact, if it were not for the birds, we would have not seen much wildlife at all on this adventure. 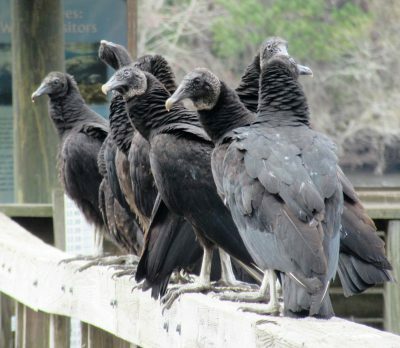 What was amazing to me is that I was able to walk within about four feet of a big group of black vultures before finally getting close enough to scare them away. 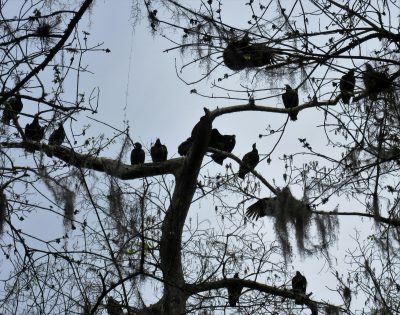 Below you will find some of our bird pictures from our enjoyable visit to Manatee Springs State Park. 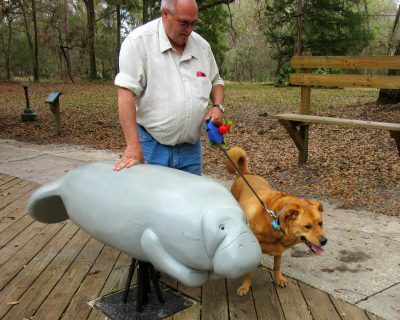 On this day, In Manatee Springs Park, manatees vs birds, the birds win. You can read more about the park by following the link here. Thanks to Pat and Judy of www.emptyingthebucketsite.wordpress.com for help with bird identification. Hey Angela! I’m thinking that bird you wanted to know about is most likely an Anhinga. They dive down for their food and then stand around holding out their wings to dry. As for the white bird, he’s an egret. 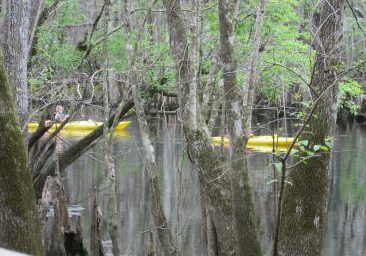 Love the water birds and glad you had a good visit to Manatee Springs! Cool! Thank you. I don’t know my birds, especially water birds as I’m from a very inland state. Thank you, Judy and/or Pat! I’ll make corrections and give you credit for the help.